Unsure what to do with toys your children no longer play with or clothes they outgrew? 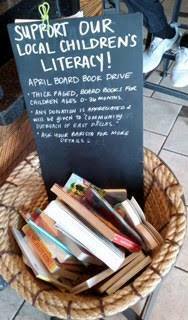 Or are you interested in hosting a board book drive? Family Outreach accepts donations of new and gently used baby clothes, toys, books and safety equipment like cribs, strollers, and car seats. We also accept gifts for new mothers and tickets for family outings. Contact us to schedule your donation drop off! $500 provides one six-week Triple P course for 8-10 participants. Your contribution helps families thrive!